In GO LONG, authors Dennis Carey, Brian Dumaine, Michael Useem, and Rodney Zemmel reveal how some of the world’s most prominent business leaders resisted short-term pressures to successfully manage their organizations for the long term, and in turn, aim to create more jobs, more satisfied customers, and more shareholder wealth. “A must-read. If you’re looking to build or lead a company that grows consistently not just from quarter to quarter, but year to year… this book is for you.” —INDRA NOOYI, CHAIRMAN & CEO, PEPSICO, INC. 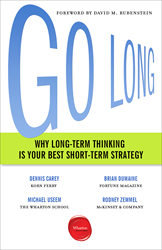 In GO LONG: WHY LONG-TERM THINKING IS YOUR BEST SHORT-TERM STRATEGY (May 8, 2018, Wharton Digital Press), authors Dennis Carey, Brian Dumaine, Michael Useem, and Rodney Zemmel take readers behind-the-scenes to witness the business decisions that are enabling leading organizations to outsmart and outlast the competition. Dennis Carey is a Vice Chair of Korn Ferry and founder of the CEO Academy®. Brian Dumaine is a contributor to Fortune magazine. Michael Useem is professor and director of The Wharton School’s Leadership Center. Rodney Zemmel is senior partner at McKinsey and managing partner for New York, Boston, and Stamford. They are the organizers of the CEO Academy®, the annual off-the- record gathering of chief executives. Wharton Digital Press was established to inspire bold, insightful thinking within the global business community. In the tradition of The Wharton School of the University of Pennsylvania and its online business journal, Knowledge@Wharton, Wharton Digital Press uses innovative digital technologies to help managers meet the challenges of today and tomorrow. As an entrepreneurial publisher, Wharton Digital Press delivers relevant, accessible, conceptually sound, and empirically based business knowledge to readers wherever and whenever they need it. Its format ranges from ebooks to print books available through print-on-demand technology. Directed to a general business audience, the Press’s areas of interest include management and strategy, innovation and entrepreneurship, finance and investment, leadership, marketing, operations, human resources, social responsibility, and business–government relations.